You can view and update your notification settings here. By default, you will get notifications to all of these channels. You can get notifications to as many or as little of these ways as you'd like. And for browser notifications and mobile push notifications, you can choose whether or not to also get a sound along with them while you're in app.drift.com. If you are not active, we'll notify you about any new messages through the notification channels you chosen (desktop, push, email). If you are active, we will send you browser notifications, but not push notifications (even if you have them enabled) because it means you're actively in Drift and it would be annoying for your phone to constantly buzz about conversations you're already answering. Being active means that you have done something (moved your mouse, clicked a button, typed something) in app.drift.com within the last 20 seconds. If you are looking at the Drift app in an open browser tab, we'll send out the push notification noise, but not the actual banner from the side of your screen. For email, to avoid flooding your inbox, if any more messages are sent after the first email notification, we wait 15 minutes until the last message and then we'll send you an email with everything you missed in that conversation. In an ongoing conversation, we'll queue messages to notify you about every 15 minutes, with the final notification coming those 15 minutes after the last message. So you can expect one initial email, then emails every 15 minutes through the exchange if it's a continuous conversation. Do browser notifications work in all browsers? Yep! 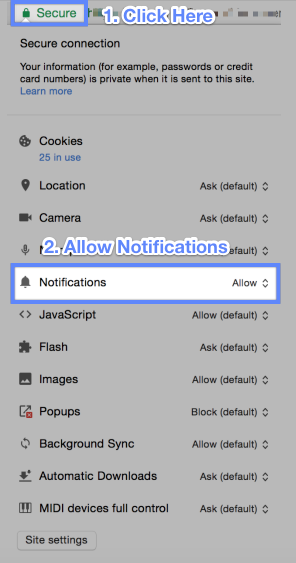 Browser notifications work in Chrome, Safari, and Firefox. How do I make sure I get browser notifications? Browser notifications will appear at all times regardless of whether Drift is open in a browser and running in the background. This setting can be toggled off at any time in your settings. Are you not getting the browser notifications even with app.drift.com open? Check that they are enabled in your browser. Can I change the sound or make it louder or softer? You can change the sound here, but there's currently no option to make it louder or softer. You can turn up or turn down the volume on your computer accordingly. Can I get notified about every single message? You can! - You can set your notification settings to "All Conversation" so you will be notified even if you are not a participant in the chats. I was getting email notifications but now they stopped - what gives? If all of your settings are turned on to receive email notifications, you may no longer get emails if something in your email servers caused one of our emails to bounce. Our system automatically stops sending email notifications to accounts where emails bounce so we don't wind up in future spam folders. If you've exhausted all reasons as to why you might not be getting emails from Drift anymore, let us know and we can take a look.